Beginning this school year, the Monday of final exams week will begin with a minimum day schedule in the morning, followed by a lunch period and then the sixth-period final. As the Carlmont community wraps up its first semester of the 2017-2018 school year, students and staff members will have to adapt to a change in the final exam schedule. For both semesters this school year, there will be a minimum day schedule in the morning on Monday, followed by a lunch period and then the sixth-period final that ends at 3 p.m. The rest of the week follows with first and second-period finals on Tuesday, third and fourth on Wednesday, and fifth and zero on Thursday. Additional office hours will be available for students from 8 a.m. to 9 a.m. on Tuesday, Wednesday, and Thursday. This is a change from the final exam schedule of previous years which did not include a minimum day schedule on Monday. There were two finals per day on Monday, Tuesday, and Wednesday beginning with the zero period final. Thursday only had the sixth period final, allowing students to leave campus at 11 a.m. 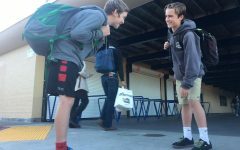 According to Principal Ralph Crame, the reason for this change was to follow a specific rule that would allow Carlmont to count the final exam days as school days. “The reason for the change is to be in compliance with Ed Code that states a school day must have at least 180 minutes to get credit for an official school day and count towards instructional minutes,” said Crame. A school day must be at least three hours for it to count, and having a sixth-period final alone on Thursday as in previous years is only two hours of school. Admin decided to move the sixth period final to the beginning of the week in hopes of benefitting students. However, despite this effort, students have mixed feelings about this change. Viki Plut, a senior, has a zero period but does not have a sixth period, and receives benefits from the new schedule. “The only way the new schedule affects me is that I no longer have finals to study for by Monday because I don’t have a sixth period. So personally, it is beneficial to me because I now have at least one extra day to study for my final,” Plut said. Although it may advantage her, Plut is aware of the issues this change can cause some students. “I do know people who are negatively affected by this schedule. The Thursday of finals week is ending later than originally planned, which is a huge inconvenience for students and teachers who need to leave for the holiday break that day. For this reason, I wish that the staff had caught their mistake earlier,” Plut said. Some teachers, such as foreign language teacher Roberta Scott, believe that this schedule is a positive change for the Carlmont community. 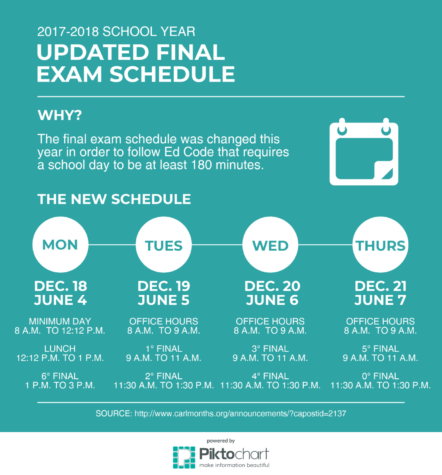 With final exams approaching in a few weeks, the Carlmont community is working to ensure that all students are aware of this change in schedule. 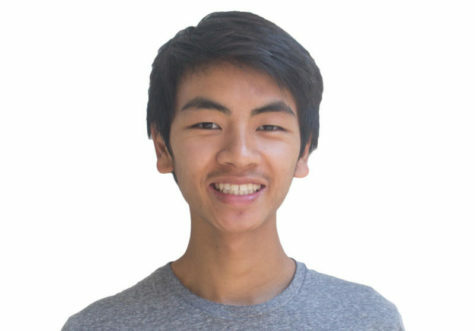 “The new schedule has been posted on the Carlmont website, it will be a part of my monthly email later this week, I have spoken to PTSA and CAF about it in our meetings this week, it is mentioned in the daily announcements before lunch, it was posted on the Facebook page, and it is on the school calendar,” said Crame. Although final exams on Tuesday, Wednesday, and Thursday will begin at 9 a.m., teachers will be available to answer questions at 8 a.m.
“Please take advantage of the office hours. 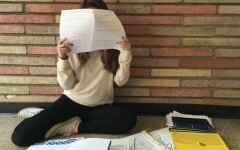 I love students who check in and speak with me during office hours to review exams, which will help them learn from mistakes before the final, and to talk with study teams in the classroom,” said Scott. 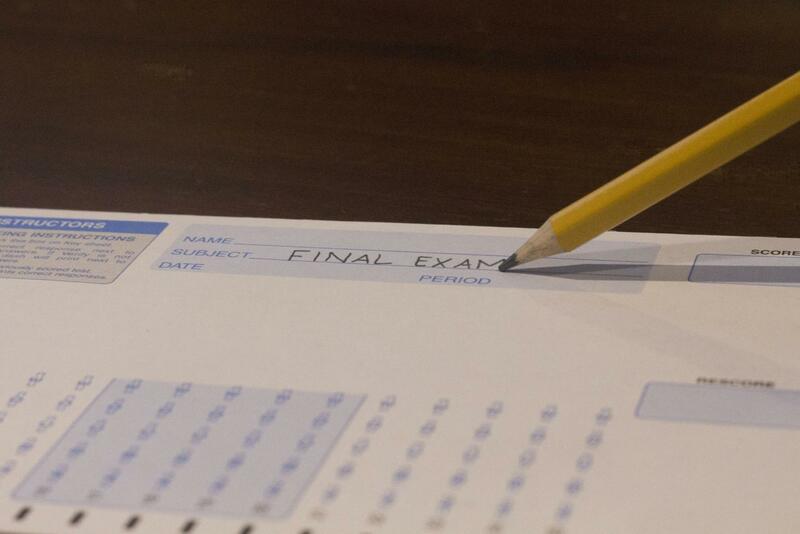 Final exams begin Dec. 18 and end on Dec. 21 for the first semester. For the second semester, final exams begin on June 4 and end on June 7.